We developed Pitt Law's Health Care Compliance Online (HCC Online) by working with experts in compliance, law, and online education. Our advanced, accelerated program will support you as you take on more strategic compliance roles. Learn the relevant law, practical applications of compliance, best practices and explore current issues. Interact with expert faculty—professors from the School of Law and Graduate School of Public Health, current and former federal regulators, and compliance industry experts. Network and collaborate with your peers in other industries and locations through innovative online applications. Work on weekly assignments when and where you choose. HCC Online is eligible for Post 911 GI Bill® benefits. Check here to learn more about your education and training benefits. GI Bill® is a registered trademark of the U.S. Department of Veterans Affairs(VA). More information about education benefits offered by VA is available at the official U.S. government Web site at https://www.benefits.va.gov/gibill. HCC Online course work is asynchronous, meaning there are no scheduled meeting times or locations. You will complete most courses in just eight weeks, working through weekly modules, based on your own schedule and from any location. HCC Online's total tuition is $9,495, which is less than the cost of comparable programs from any other university. For a video overview of the Health Care Compliance Online program, watch the virtual open house. The video explores the program and details the benefits of this graduate certificate. Approximate viewing time: 10 minutes. Applicants must have earned a baccalaureate degree at an accredited institution. Admissions decisions will be made based on professional experience, academic credentials, and a personal statement. In some instances an interview (online or via phone) may be required. Candidates apply to the HCC Online program through Pitt Online. Facilitate peer-to-peer learning and networking opportunities. Our mission is to equip current and future compliance professionals with the knowledge, skills and judgment they need to institute and champion ethical compliance in a rapidly changing environment. Integrity – We practice being truthful and ethical in day-to-day activities as well as in times of great challenge. This requires a strong sense of self and on occasion, great courage. Knowledge – We seek to understand complex concepts as well as to master how we use these concepts for the benefit and safety of patients. We have an excellent grasp of the subject matter of compliance. Compassion –We recognize and appreciate that the wellbeing of the health care patient is at the heart of all our efforts. Creativity – We prize and instill critical thinking, curiosity, and imagination as we prepare future compliance leaders to spot issues, evaluate challenges and solve problems. Teamwork – We achieve more together than we ever can alone. Effective compliance cannot exist without teamwork. We value respect, diversity, and trust as we leverage the power of teamwork. We spoke with many employers—large and small—in the health care industry. All said there is a growing need for compliance professionals who understand the reasons behind the rules and can apply specialized knowledge and an understanding of the broader business context to solve problems and work with their organizations to ensure ethical compliance. Health Care Compliance (HCC) Online is designed to meet this need. In addition, our research told us attorneys, administrators, and health care professionals are also interested in a program like ours, because compliance is becoming a more significant part of their responsibilities. HCC Online is ideal for compliance professionals who want to augment their professional development. It is also an excellent program for those who may need or want to have a deeper understanding of compliance, or who are looking for a career change. Our program is also particularly suitable for attorneys, administrators, health care professionals, and social workers who work with compliance issues. Our research indicates these professionals are particularly interested in the content of our program. HCC Online commences each January and concludes each October. Students take one course at a time, but each course is delivered in an accelerated format and is only eight weeks long. This means students take two courses in the spring semester; enjoy a short break; take two courses over the summer; enjoy a second break; and take a final course in the fall semester, finishing in October. HCC Online provides 15 graduate-level credit hours of education for $9,495, or $633 per credit hour plus any additional fees and the cost of books. Students should check with their employers to see if they offer tuition reimbursement for this program. 5. Do the credits earned in Health Care Compliance Online transfer to other University graduate programs? Students earn 3 graduate credits from the University of Pittsburgh School of Law for each course completed in the HCC Online program. Students interested in applying HCC Online courses toward other graduate degrees should check with the degree program/institution of interest to determine if the credits will be accepted for that program. 6. How much work should I expect? There is a significant amount of work in the program because courses are accelerated. Students should plan on at least 12 hours per week for course work. In addition, because there are no extensive lectures, most of the work is self-directed. You choose when and where you do your work. Classes are delivered through weekly modules and include weekly assessments, so you will always know how you are doing and be able to test your understanding of important concepts. 7. What are the requirements for admission? 8. I don’t have an undergraduate degree with a cumulative 3.0, can I still be admitted? Students who earned lower GPAs may certainly be admitted based on their work experience, their application, and potentially an interview, which would take place by phone or online. 9. Who are the faculty? Our expert faculty is composed of professors from the University of Pittsburgh School of Law and Graduate School of Public Health, as well as current and former federal regulators and industry experts. 10. Are the courses also taught on campus? 11. Do I have to be online at a specific time to complete the course work? No. All course materials can be accessed at any time and students can work on their own schedules to complete assignments by course deadlines. However, group projects will require coordination among your online team members. 12. Will I be required to come to the Pittsburgh campus at any time? No. While our campus is beautiful, and we welcome visitors, you will not be required to come to campus as part of the program. 13. What resources will be available to me as a student? 14. What final grade point average (GPA) is needed to successfully earn the certificate? Students earning the certificate will be required to earn a final GPA of 3.0. 15. How much should I expect to pay for books in this program? Most books are available both as new and as used textbooks. Students who will buy new books can expect to spend an average of approximately $550.00 on new books over the five courses. Students can reduce this cost by buying used books, or taking advantage of book rental programs through providers like Amazon. 16. Is financial aid available? Unfortunately, financial aid for this program is not available through the University. 17. If I have federal student loans, will they be deferred during the time I am in the Health Care Compliance Graduate Certificate Program? Students who are enrolled at the University on a part time basis (at least six credit hours per semester) are entitled to federal student loan deferment. Under the HCC Online program, students may take two courses in the spring semester, two courses in the summer semester, and one course in the fall semester. This means that federal student loans would be deferred for the spring and summer semesters, but not for the fall semester. 18. Do I need to be an expert with technology? What kind of computer equipment do I need? While you needn’t be a technology expert to take an online class, you should have some proficiency with a computer, e-mail, saving and writing electronic documents and navigating the Internet. Additionally, your computer will need to meet our minimum technology standards in order to access online course content. Make sure to check our technology requirements. Our technical requirements are listed on our Support page. 19. I’ve never taken an online course before. Will I receive any training? As a Pitt Online student, you will have access to our online Student Orientation course, tutorials and the student handbook. Additionally you’ll have access to our 24/7 technical resources to support any questions about the online course system and materials. Each course in Health Care Compliance Online awards three graduate-level credits and most are completed in eight weeks. The program starts in early January of each year. Each year’s cohort takes four core courses that provide a strong foundation and clear understanding of health care compliance issues. After completing the core courses, students customize their final capstone course. They select three of seven two-week seminars and also work closely with the Program Director to complete an individual project in their area of interest. Students select three seminars to customize their substantive focus, and complete an individual project with the Program Director. Seminar class limits: 15 students. Students and professionals who wish to enroll in the Health Care Compliance Online graduate certificate program apply online at Pitt Online. 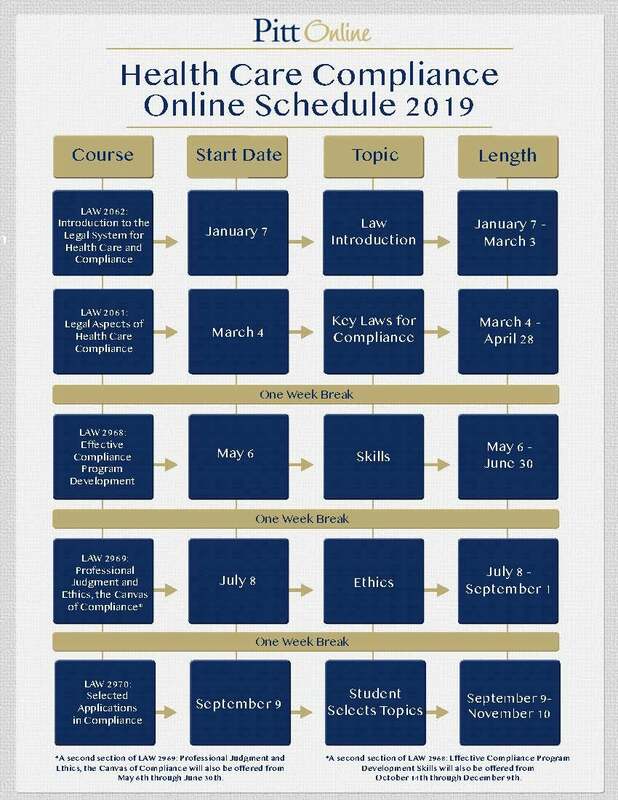 Explore an in-depth overview of the Health Care Compliance Online courses and modules that students take over the ten-month graduate certificate program. 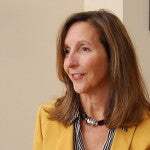 The Health Care Compliance Online expert faculty comprise of professors at Pitt Law, the Graduate School of Public Health, current and former regulators, and compliance industry experts.